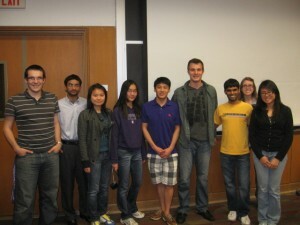 On May 19th, I spoke at Northwestern University. The title of my talk was “What I Wish I Knew About Personal Finance in College” (link contains slides). This was my first talk in front of a large audience. Although I admit I was nervous, after it was over I had a great feeling hearing the positive feedback. Many students even said it was the most useful event Tau Beta Pi, the organization that held the event, has ever organized on campus! The talk was scheduled 40 minutes with a 20 minute Q&A to follow. However, the Q&A went for an hour (many questions on establishing credit out of all things). I wasn’t able to record the entire talk but was able to get a majority. I like to thank Gopi, a reader of Gen Y Wealth and student at Northwestern, for organizing the event. Plus, all the students for coming out. It was an amazing learning experience for me, and hopefully for them as well. I have to give a speech on personal finance this September … I’m normally comfortable with public speaking, but this is my first PF speech, so I’m quite nervous! I’m glad to hear that yours went well and that the audience was engaged and had questions. Good luck Paula. My one word of advice is to keep it as simple as possible. Remember, a lot of people, especially those who don’t read PF blogs every day, don’t even know their credit score matters and what exactly a 401(k) is. Congrats on your speaking engagement! I’m happy to hear it went well. Keep up the good work, RJ. Thanks Ornella. It was a great experience. Something I want to do again in the future. You speak in a very knowledgeable and engaging manner and I think your audience appreciated that. Your slides are also easy to comprehend. I wish you more speaking engagements in the future! For sure there will be more to come. Sharing through lecturing is the easiest and most fun way to reach out and get your message out there. Thanks June for the kind words. You’re going to be an author/speaker/finance expert when you grow up huh…Good job RJ. Keep the ball rolling! Helpful presentation. Wish we could see the slides. You should do a podcast and take questions from readers. It’s easier to relate to financial advice when it’s applied to a person.